Update: Thanks to cowens and others who informed us that this is actually an absolutely massive piece of land art called desert breath. Click through for some images and a way better description than I gave it! 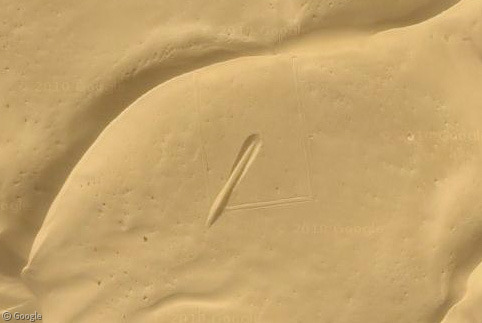 What on earth is the purpose of this massive spiral in the Egyptian desert? It appears to be made from near-perfect circles scooped from the sand, which decrease in size toward the centre of the spiral – where there is a much larger circular trench. Whatever the spiral’s purpose actually is, it must have taken a serious amount of effort to put here. Awesome. Aliens would choose the desert obviously. Whoops, that should be El-Gouna. Some of the sand is in piles, and some of it is in dips. I guess it’s either been messed around with to make it permanent, or google were lucky and got the pic while the sand was still in position. I read ‘sundial’ instead of ‘spiral’ when I first saw the post, so I was convinced I was looking at some kind of hi-tech ancient Egyptian sundial. Look more closely. They are not all “pits.” One arm is made of pits but the other arm is made of mounds. The shadows are on one different sides. They seem to have a bit of a debris on the road down south aswell! View Placemark When a say debris i mean sand and when i mean a bit i mean half of the desert! The Odyssey article incorrectly states that “[it] will be completely erased by the winds within six months”. The construct process was apparently changed near the end (in 1997) to include some sort of fixative that has allowed it to last until at least 2000. I don’t know if it still exists or not. It is a resort named El Gouna (http://en.wikipedia.org/wiki/El-Gouna). You guys are all realist scum. Those roads seem to missing from the original images. Leave it to the traffic engineers to screw up all of the scenery. For some reason, when I click on the “View in Google Earth” link, Google Earth doesn’t load anymore. The photo is of an artesian well system of hand-dug wells. It is part of a primitive irrigation system and can be found all over the middle east. Cyre – I’m not sure why that is, but hopefully we can sort it for you! In the meantime, clicking on the downloaded file will launch Google Earth. Did anyone else notice that Google overlapped the image incorrectly? The spirals don’t match up. If you compare it to the pictures in the links above, the satalite image has ghost holes/mounds where the image didn’t align correctly. How did they actually create a piece of art like that out of sand and it sill stays together and doesn’t get damages by the wind that blows over the desert? This is just a few hundred metres from the juction where the road to El Gouna meets the main road to Hurghada. I’ve just come back from a week’s diving in El Gouna, so I wish I’d seen this before I went, then I could have experienced it from ground level. No-one mentioned this at the resort. I will try e-mailing some guys who live back there and see what they say. By the way, El Gouna is the “venice-like” resort to the east of this desert art. This place is worth a visit. I have been there many times on trips down the “west side” of the Gulf of Suez. Many of the pits are large enough to drive a car into. Many people miss the art as it is adjacent to the entrance of the large development. Thank you for the links above. I did not know that the origin of the design was once filled with water.